or $117 ea per day at capacity for a five day trip. The best rates are available for consecutive programs that engage Ernestina over a period of several or more days. Schools, organizations and sponsors may collaborate to provide for programs in coastal communities such as Gloucester, Salem, Boston, Quincy, Provincetown, Buzzards Bay, Woods Hole, Martha's Vineyard, Nantucket, New Bedford, Fall River or Providence. The Schooner Ernestina office will help schedule and coordinate the series of programs to best advantage. Various strategies have been utilized to develop funding for programs with Ernestina. Several alternatives with descriptions follow that may aid in identifying a strategy useful to your school or organization. Community Foundations Funds may be raised by support organizations and applied to all or a portion of the cost of the program. Students Students may provide some portion of the cost by developing their own sources. Business Sponsors A corporate sponsorship program is available for companies at a $5,000 level. The sponsorship will cover the cost of a program for a school or organization of the sponsor's choice. The sponsor will also receive full recognition on Ernestina's website and in our newsletter along with acknowledgement in articles in local and regional print media. Foundation Support Funds provided by a foundation or other funder may cover some portion of the cost. Ernestina staff are able to help identify funders and assist with grant writing. 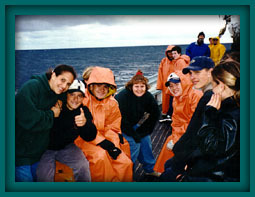 In May 1995 and 1996 two weeks of programming was funded by the Boston Marine Society and the Boston Public Schools as a result of a proposal developed by Ernestina staff. In June 1995, three days of Sharon Middle School programs were funded by the PTO. In 1995 and 1996, programs in Vineyard Haven for the Martha's Vineyard Schools were funded in part by the school system, local organizations and individual participants. In 1995 and 1996, a series of onboard conferences and meetings of teachers, educators and agencies was co-funded by the Mass. Departments of Environmental Management and Education. In Spring of 1996 school programs on Cape Cod were made possible thanks to contributions from area Rotary and Lions Clubs. In August 1996, a six day program through Urban Scholars at UMASS Boston was funded by John Hancock Insurance, Upward Bound and student fundraising activities.